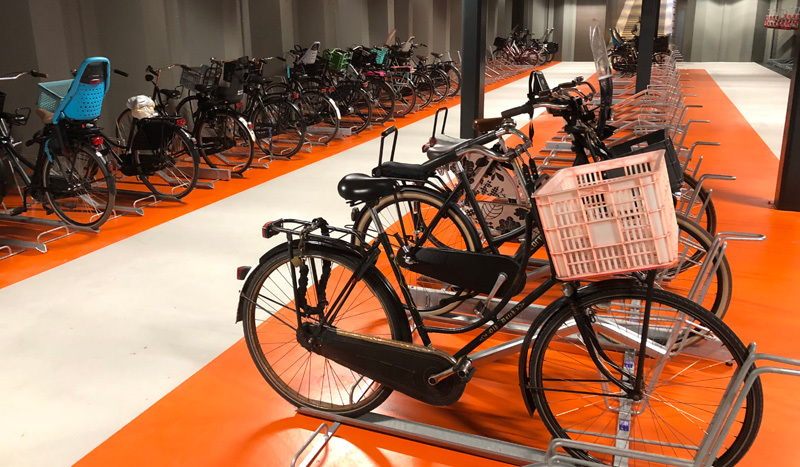 A third large new bicycle parking facility was opened last Thursday in Utrecht. It is also the third largest parking garage near the central railway station, with a capacity of 3,000 bicycles. 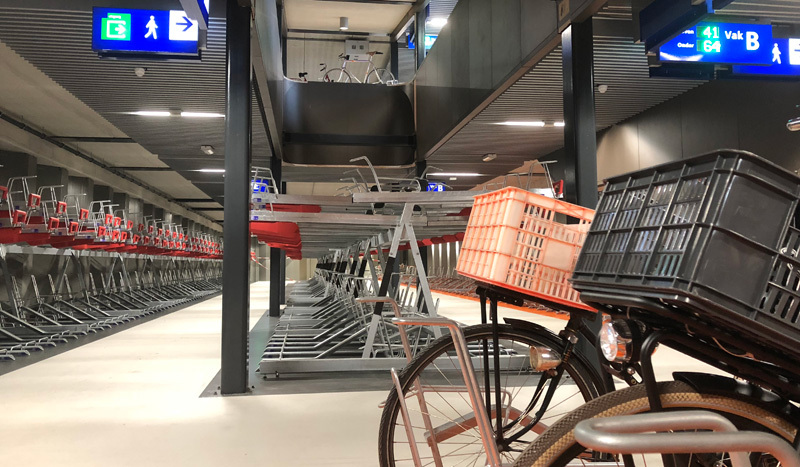 The Knoop stalling bicycle parking facility was built on an elongated piece of land parallel to the railway tracks, which gives it some unique characteristics. 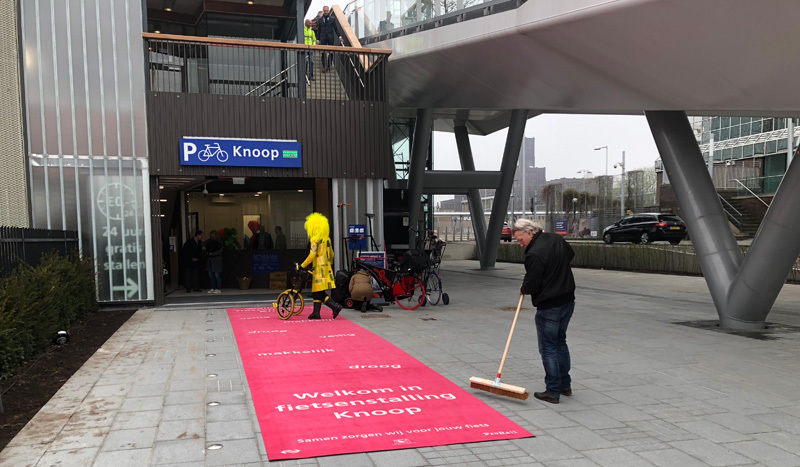 Sweeping the red carpet that reads: “Welcome to the bicycle parking garage Knoop, dry, convenient, safe” (parking). The green screen above the door shows the total number of free parking spaces. The facility was almost built back-to-back with one of the other two big garages, the Jaarbeurspleinstalling, that I wrote about when it was opened in 2014. But since the entrances to both are on the opposite ends, they seem a long way apart. The other big parking garage is on the other side of the railway tracks, the historic city centre side. That is the one which will be the largest in the world, once it is finished by the end of 2018, possibly early 2019. That facility was partly opened last year and it only has a north-entrance so far, because the south side is still under construction. That means there is a shortage on bicycle parking on the city centre side, south of the station. The entrance to this new Knoop facility is right under the new bridge across the railway tracks, the Moreelsebrug that I also wrote about in an earlier post in 2017. That is a very good location for the entrance, because people from the other side of the railway tracks, where there is that shortage on parking, can use the bridge to easily park in this facility. 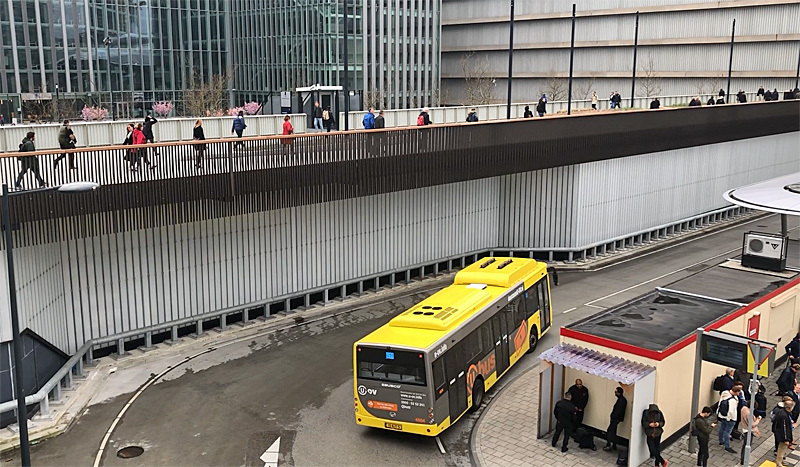 To show the people of Utrecht that this alternative exists, it will be connected to the city’s electronic bicycle parking guidance system, that Utrecht has since 2015. The Jaarbeurspleinstalling is often full and always very busy, so many people welcomed this alternative. One of the two long rows at ground level. The bottom racks had filled up nicely in the first few hours after the first opening. On the right hand side the bright frosted glass wall. On the ceiling the letters to indicate the separate sections, some with an electronic indication of the number of free spaces. The new garage is located on a small plot of land parallel to the railway tracks. Part of a much larger area that had long been the location of a military compound, named after Dutch lieutenant-general Willem-Jan Knoop. He was famous for challenging the British view of especially the Dutch role in the Battle of Waterloo, as it was recorded by English military historian captain William Siborne. The 19th century lieutenant-general’s name now lives on in a bicycle parking garage. The basement is for bicycles that would not fit in the standard two-tier racks. Bicycles with baskets and/or children’s seats. Utrecht’s railway station hall is at a level of over 6 metres above ground level, as is the adjacent shopping mall. This was modern in the 1970s, but over time people saw the negative aspects of the dark underworld that was created with such a world on a +1 level. In the reconstruction of the station area much attention was given to getting rid of these dark underworlds. Unfortunately, the city is stuck with that +1 level and new connections to it must sometimes be made. Now that there is a new bridge at almost the same level, it made sense to connect the two. Indeed a new walkway at that level was constructed to connect the station concourse, the bridge and the many offices. Lots of people use that new walkway every day. The architects who designed the new walkway (Group A) also designed this new bicycle garage underneath it. The building was commissioned by the city of Utrecht and both railway companies. The side view shows just how long the facility is. The entrance is on the right hand side on this drawing. The structure next to the facility is the Moreelsebrug. Picture Group A architects. The plan of the surroundings shows just how elongated the site of the facility is (coloured pink). 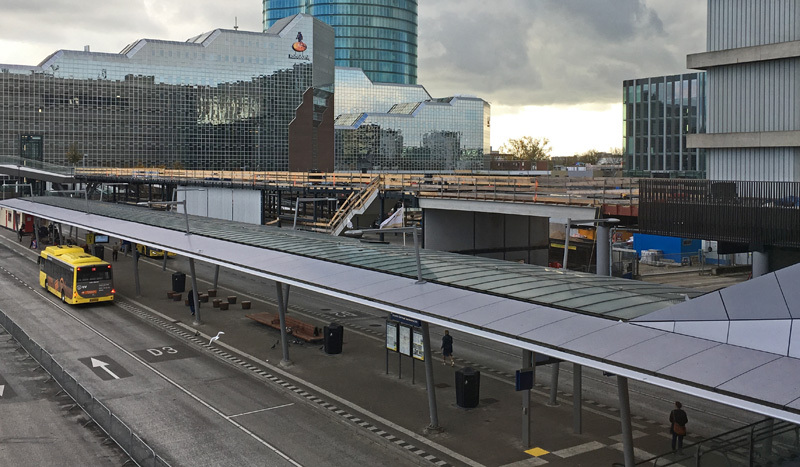 To the left is the elevated station concourse under which we find the Jaarbeursplein bicycle parking garage. Picture GroupA architects. The building process was quite short. Although construction started in October 2016, you could not see any activity yet when the Moreelse bridge was opened in December 2016. However, in November 2017 the frame of the building was already finished. The elongated shape of the site dictated how much of the space needed to be used. The racks could only be placed parallel with the long side of the building. Had they been placed perpendicular, it would lead to numerous short dead-end corridors that would be socially unsafe. Such a placement of the racks would also render the building complicated to understand. 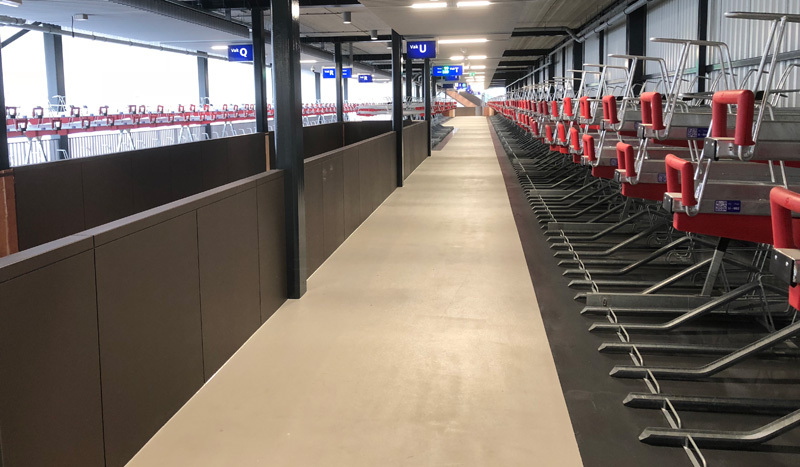 The three floors, one on ground level, one in the basement and one just under the walkway, give room to place two-tier racks for 3,000 bicycles. Two-tier racks are the standard in the Netherlands. The wall between the facility and the bus station, that is in turn located between the building and the railway tracks, will always be free. That is why the architects decided to make that a wall of frosted glass. This floods the building with light. So much light inside is quite the opposite of the dark underworld that had existed under the 1970s walkways. A very deliberate choice. The top floor was still almost completely empty on the first morning the facility was open. This time the glass wall is on the left hand side. The dark brown railing is around the ramp giving acess to the top floor from the ground floor. Like any modern Dutch bicycle parking garage this one also has an electronic system to indicate where there are still free spaces. But the system had to be adjusted slightly. With just two very long rows it would not make sense to indicate the free spaces per row. That is why the rows were divided into sections, each identified with a letter. The facility is so large that the whole alphabet was needed. That is how many sections there are. From the outside you can almost not tell this is a bicycle parking garage. It is interesting (and perhaps a shame) that the frosted glass wall is so opaque. It almost looks like steel. I expect it to be lit up at night though. The people are actually walking on the roof of the facility. This facility is clearly an extra facility, to relieve the other two. That becomes apparent from the fact that is not open 24/7 but “only” from 6:30 in the morning until midnight. There are also fewer amenities. There is no workshop and you cannot rent an OV-Fiets (shared public transport bicycle) or a stroller. There are also no lockers or toilets and larger bicycles, such as a bakfiets (cargo bike) cannot be parked here. Fortunately, there is room for bicycles with baskets and for bicycles with children’s seats, because those types are very common. They can be placed in the basement where there are single tier racks, placed much wider apart. The usual “station pricing regime” is in place. That means that parking is free for the first 24 hours and after that you pay €1.25 per day. If you need to leave your bicycle over the weekends often, an annual subscription of €75 may be more attractive. You need a public transport chip card to be able to check your bicycle in and out. This is cause of much misunderstandings with foreigners who usually do not have an OV-chipkaart as they are called in Dutch. In the fine print of the regulations of every facility (including this one) there is a line stating: “If you do not have a public transport chip card you can get a temporary card from the warden of the facility”. Yet many foreign visitors report they got sent away for not owning an OV-chipkaart. I don’t know where that goes wrong in the conversation. Maybe you need to ask for a “loan pass” (leenpas in Dutch) and not for a Public Transport chip card. I noticed many of the wardens in the facilities aren’t fluent in English and that’s perhaps why these misunderstandings arise so often. It could also be necessary that they need an extra instruction on this matter. It would be better if the many enthusiastic foreign visitors aren’t treated so unwelcoming. Some light comes from the groundfloor into the basement area. That also has a number of two-tier racks, besides the racks for bicycles with baskets and/or children’s seats. 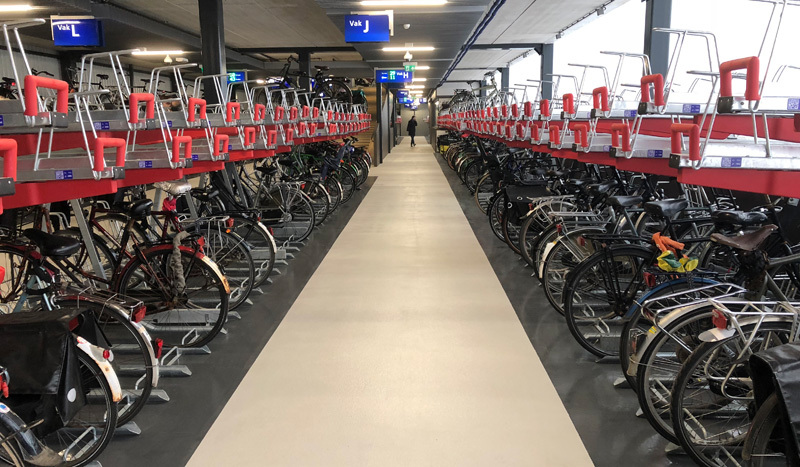 Two-thirds of the planned 22,000 public bicycle parking spaces at Utrecht Centraal have now been constructed with the opening of this facility. With the ones that will be opened later and the private ones (for employees of the many offices) the total number of bicycle parking spaces will get to over 32,000. But it is already known that this won’t be enough in the future. Utrecht is the fastest growing city of the Netherlands and more spaces will be needed. It’s either that, or the whole concept of the single intercity station of Utrecht would have to be revised. Opening more intercity stations in Utrecht would lead to nationwide changes in the timetable of the intercity network. That is a big challenge that needs to be solved in the future. For the time being Utrecht is building parking spaces and very nice ones they are. This week’s video about the new Knoop bicycle parking garage. Great video. This looks like it will be a great asset o the cycling community. What prompted your logo change? 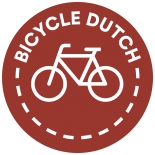 This entry was posted on 17 April 2018 by Bicycle Dutch in Original posts and tagged cycle parking, railwaystations, underground parking, Utrecht.